OSHA 10 Expiration: Do you need to renew your training? Since 1971, OSHA has been setting the standards for safety in construction and several other industries. After you complete OSHA training, you usually receive your card in the mail from the Department of Labor within a month or two. When you receive the card, you may notice that there is no expiration date printed on it. This leaves many people wondering if, when and how they should renew their OSHA 10 or 30 training. Does OSHA 10 Hour Expire? The short answer to this is no. Remember, there is no official “certificate”, but there is a wallet card that acknowledges completion of a course from an OSHA accepted provider and this card does not expire. The only exception to this rule is for maritime industry cards. If you earned your OSHA 10 card through this program, it expires after five years. You must complete an updated course prior to the training expiration date, which should be printed on the card. How Long Is OSHA 30 Training Good For? You can breathe a sigh of relief with this question’s answer as well. OSHA 30 cards do not expire. In some states, this training is voluntary. However, it is mandatory in several states for certain industries. If you are self-employed, be sure to find out if your state requires it. The training is highly beneficial even when it is not required. If you are an employee or a prospective hire, your employer may require it whether the state does or not. It’s Important to Renew Your Training Anyway! Although OSHA 10 and 30 training courses do not expire in their validity aside from those in the maritime industry, it is still important to renew your training. Your employer may even require refresher courses periodically. If this is not the case, you can still benefit yourself and others from refreshing your knowledge. The same is true if you are self-employed. Since OSHA changes its standards frequently, renewing your training keeps your knowledge current. It is easy to forget important rules or fall into dangerous habits without continuing training. Employers and clients prefer individuals who have updated training. You will help keep yourself and your coworkers safer on the job. If you are a proactive safety role model, you are more likely to be promoted. Letting your knowledge dissipate and not being aware of updated regulations can be just as dangerous as not receiving training at all. In November 2016, OSHA released a news bulletin about a 23-year-old New York man who was killed earlier in May by a wood chipper. It was the man’s first day on the job, and his employer had not provided proper OSHA safety training. The man and other workers had not been taught how to avoid the machine’s dangerous rotating parts, and OSHA determined that safety training could have prevented the young man’s tragic death. This is just one of many incident examples that reflect the need for not only initial training but updated training as well. When lives depend on safety, it must always be the top priority. If your employer does not ensure this, you can be proactive by updating your training and encouraging your coworkers to do so as well. You should refresh your knowledge of the basic safety 10-hour course annually, and most training agencies and OSHA recommend updating your 30-hour training every few years. 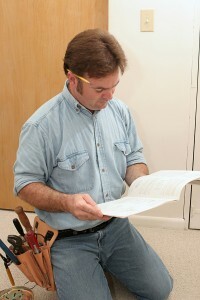 We offer initial training and renewal training for OSHA 10 and 30 courses here. If you need help deciding which course to take, we can assist you in finding state requirements or recommendations for your industry. Please contact us to learn more about OSHA 10 and 30 training as well as the other courses we offer. OSHA courses set the standard for workplace safety. However, with so many course options, it’s easy for supervisors to get confused. Many wonder if a 10 hour course will do the trick, or if they should invest the time and effort in an OSHA 30 hour course. What’s the Difference Between an OSHA 10 and OSHA 30 Hour Course? While all OSHA classes teach how to identify, avoid, and control workplace hazards, the 10 and 30 hour OSHA course differ in the depth and variety of topics covered. For example, the 30 hour OSHA course for construction includes 3 hours on personal protective equipment (PPE), as opposed to 30 minutes in the OSHA 10 equivalent. In addition, OSHA 30 hour courses are generally geared toward supervisors and prospective supervisors, and the 10 hour courses provide a basic safety knowledge foundation for general workers. 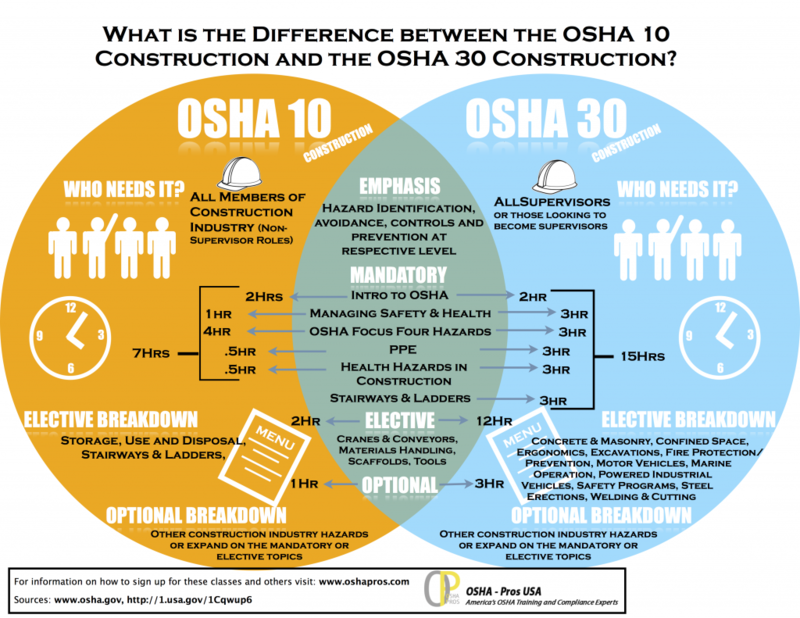 These visual representations of the OSHA General Industry and Construction classes can help clarify the differences. Regardless of which OSHA 30 hour course you choose, you’ll gain valuable knowledge and skills to lead your team safely and efficiently on a broader scope of projects. Decide which course best suits your needs and register today! OSHA has set the standard for safety in construction and general industry since 1971. Thousands of workers each year enroll in OSHA 10 hour courses and learn how to protect themselves from workplace hazards. While OSHA course completion remains voluntary in several states, it demonstrates a commitment to safety and respect for the industry as a whole. Can I Earn an OSHA 10 Certificate? As a government agency, OSHA doesn’t issue official “certifications” for completing a workplace safety course. While you won’t become OSHA 10 “certified,” completing an onsite or online OSHA 10 safety training course earns you an official OSHA U.S. Department of Labor wallet card. The card is recognized by all 50 states. 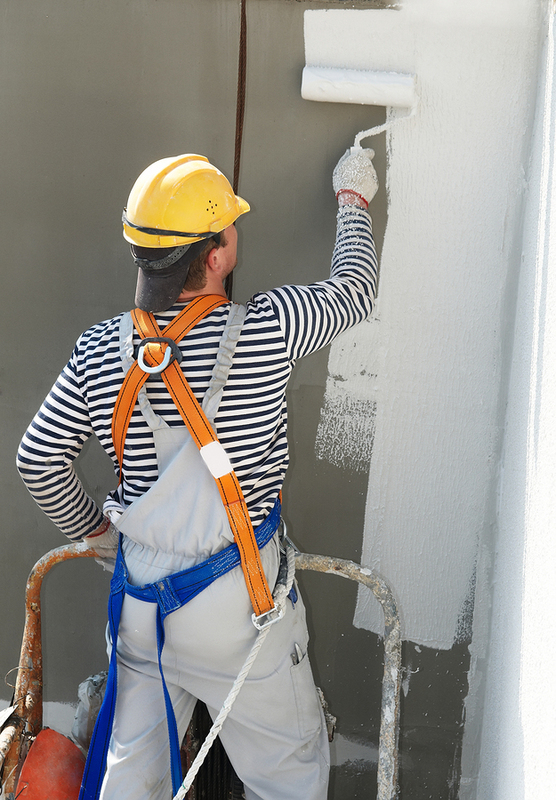 Refresh your OSHA 10 knowledge today! What Will I Learn in an OSHA 10 Certified Course? OSHA 10 training teaches students how to identify and avoid mechanical, electrical, and chemical hazards in everyday work situations. You’ll learn how to reduce the risk of falls, toxic fume inhalation, electrical accidents, and more. In addition to saving lives, OSHA 10 courses help taxpayers save money and foster an industry-wide culture of safety. Will My 10 Hour OSHA Card Expire? We get lots of questions about OSHA 10 and 30 expiration. So do your DOL wallet cards expire? Once you earn your student course completion card for the OSHA construction, general industry, or disaster site categories, it will not expire. However, it is recommended that you refresh your knowledge and training every year. We suggest you read this article to understand why it’s still important to keep renewing your training. OSHA 10 hour cards issued for the maritime outreach training program expire after five years. You can renew your 10 hour maritime card by completing an update course before the expiration date. 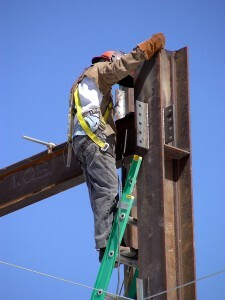 Can I Earn an OSHA 10 Wallet Card Online? Yes. 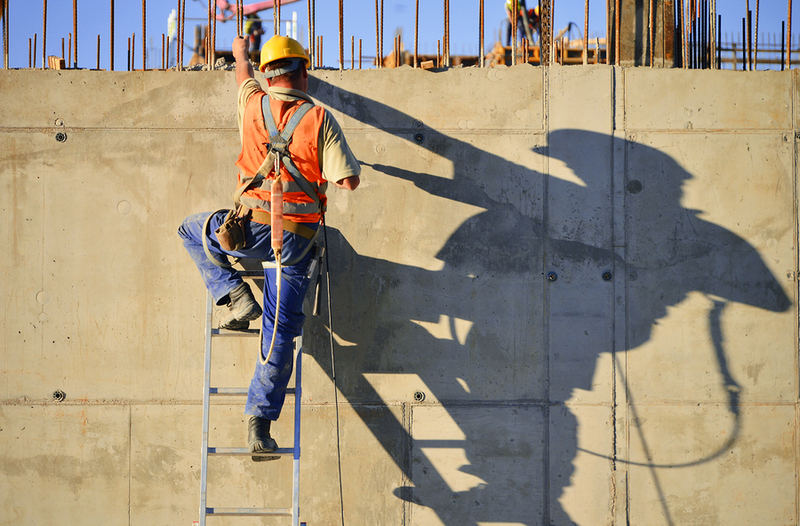 OSHA offers 10 hour online courses for construction training and general industry safety. At your own convenience, you can learn about topics including fall prevention, material handling, personal protective equipment (PPE), and emergency protocol. The construction course focuses more on materials and equipment safety, while the general industry course covers situations that can arise in any industrial setting. If you complete an OSHA 10 hour online course you will receive a OSHA 10 wallet card in the mail, the same card you would receive if you took it onsite with an authorized OSHA trainer. How Many Types of OSHA 10 Wallet Cards Are There? There are three types of OSHA: Trainer-issued OSHA 10 hour wallet cards: construction, general industry, and maritime. Students can also earn 30 hour cards for these same categories. A disaster site wallet card is available for students who complete the disaster site worker course. Earning an OSHA 10 wallet card demonstrates your ability to prevent workplace accidents and protect your rights as a worker. Workers and managers alike can benefit from an OSHA 10 training course. Enroll today and help make your company a safer place to work. Online training courses offered by OSHA have helped thousands of workers recognize workplace hazards and minimize the risk of injury. Employees and managers who enroll in an OSHA 30 hour online training program demonstrate their commitment to safety and help protect their industry as a whole. However, succeeding in OSHA30 requires more than just a name on the class roster. How can you ensure that you’re getting the most out of the OSHA course you choose? Be sure to have access to a reliable computer and internet connection. You’ll need good internet speed and connectivity to view course files, watch instructional videos, and communicate with the instructor, if needed. If you don’t have a computer or internet access, you may be able to access the course at a local library. Although OSHA online courses are accessible 24/7, you still need to allocate time in your schedule to review the course materials. A common misconception is that online classes are easier than those taught in a traditional classroom. The absence of direct student-instructor interaction and hands-on practice opportunities means students must take more initiative to structure their study sessions. While you have ample time to complete the course and earn your OSHA wallet card, don’t wait until the last minute. Make a schedule for yourself and commit to a deadline to finish the course. Then set plan to use your study time in a distraction-free environment. And, as you work through the course materials, observe and use what you have learned on the job. This will help you get the most from the course and retain your new knowledge. 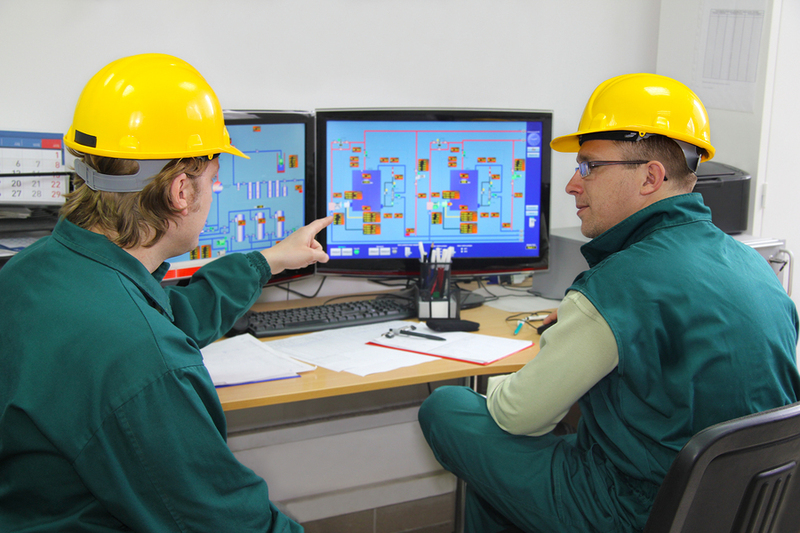 OSHA 30 hour online courses cover comprehensive topics including electrical safety, hazard recognition, and machine operation. You will need to demonstrate sound understanding of each topic in order to graduate from the program. Both the general and construction industry online OSHA30 courses require critical thinking that incorporates both facts and personal experience. In construction and other industrial fields, even a small oversight can result in a catastrophe. The OSHA workplace safety courses will enhance your ability to spot hazards, correct them, and prevent future hazards, all while observing OSHA safety guidelines. For example, you will learn what proper personal protective equipment to don before handling an electrical device. Communication is as crucial in an online class as it is on the job. Many workplace accidents can be avoided by simply addressing concerns with a manager. The same is true for your training experience. If you need help or have questions on the material, ask for help from the instructor. The more you understand and engage with the material, the more you’ll get out of the course to apply to your current and future jobs. The same rule applies to technology issues. If you have any trouble accessing course materials or using the online tools, let us know. Both of OSHA Pros’ 30-hour OSHA online courses come with a free study guide to prepare you for the exam. The online construction course teaches valuable information specific to construction and manufacturing. 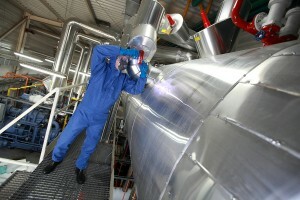 The general industry safety training course covers an array of safety topics you’ll likely encounter in the workplace. Enroll today and enhance your career with better safety knowledge to help protect yourself, and benefit your co-workers with a safer workplace environment. If your construction job requires you to complete an OSHA training course, you need to decide fast which one to take. OSHA 10 hour construction training will give you the basics, while OSHA 30 hour online provides a bit more and a number of elective choices you may need for your job. See what’s covered in one glance in our useful infographic below and get started on your training today. If you find it useful, be sure to share it with your coworkers.